Like Traser, Luminox makes use of tritium lighting but they were originally dedicated to making watches specifically for the Navy SEALS and were so successful they were approached by other units in the US Military to make specialised watches for them. Luminox Watches are commonly entirely black with the luminous markers offering the only colour and most have polyurethane rubber straps as they are comfortable, waterproof and durable making them ideal for continual amphibious operations, but they also offer military watches suited to aviators, Special Forces and even a range of casual watches. 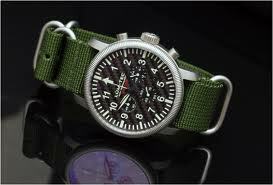 MTM Watches are some of the most impressive military watches available to buy and some of the most popular.Using the pinnacle of technologies MTM Military Watches are made using steel or titanium in their construction and hardened sapphire glass and usually have water resistance up to 300 metres. Each model is usually designed to cater for a particular aspect of the military, while primarily being made for Special Forces like the MTM Blackhawk and some are ideal for pilots while the MTM RAD Watch has been produced with radiation detectors. Most MTM Watches use multiple LED lighting systems from the premier light source to read the dials to a distress signal for help; they have modes and functions for any situation you need. There are other military watch brands too, but these three certainly have the edge on precision timekeeping, durable quality and premium features.